Chopsticks are one of the simplest, oldest and most widely used utensils for eating, and are still the primary eating utensil for over 22 percent of the world's population today. Evidence of putting together two sticks to use during cooking or eating have been found in East Asia and the Middle East. Earliest forms of chopsticks date back 5,000 years and were likely used for cooking, in order to grab food from a pot of hot water. Chopsticks have been a table utensil for the last 3,000 to 3,500 years, from around the time of the Shang Dynasty (1,600 BCE - 1,050 BCE) and became the primary eating utensil by around 400 CE. The use of chopsticks spread throughout Asia, and by around 500 CE, they were common in what is now Korea, Japan, Taiwan, Mongolia, Laos, Thailand, and Vietnam. With western expansion, the use of chopsticks dwindled in Laos and Thailand where the hand, fork and spoon are more popular, though disposable chopsticks are commonly available in Chinese restaurants. The first chopsticks came to Japan by way of Korea, around the area of Wakasa Bay on the Sea of Japan. This was a waypoint for travelers passing through between China and Kyoto, and is considered the east end of the silk road and the front gate of Japan. Chopsticks in Japan were revered as precious and used in religious ceremonies. Their earliest chopsticks were joined at the top like tweezers. It wasn't until 1,000 CE that separate sticks became the norm. While chopsticks have been and are called by many different names in Asia, such as “kuai-zi” in China and “hashi” in Japan, the word chopsticks is likely derived from Chinese pidgin English “chop chop” meaning quickly. Therefore chopsticks means “quick sticks”, perhaps an apt description given by the earliest western explorers as they first experienced people nimbly eating with chopsticks. The earliest written English use of the word “chopsticks” is from explorer William Dampier's book Voyages and Descriptions in published in 1699. Wood and bamboo were the natural early forms of chopsticks, and are still the most common materials today. In time bone, ivory, bronze, brass, silver, gold, jade, agate, coral and other exotic materials have been used, especially for wealthy chopstick owners. 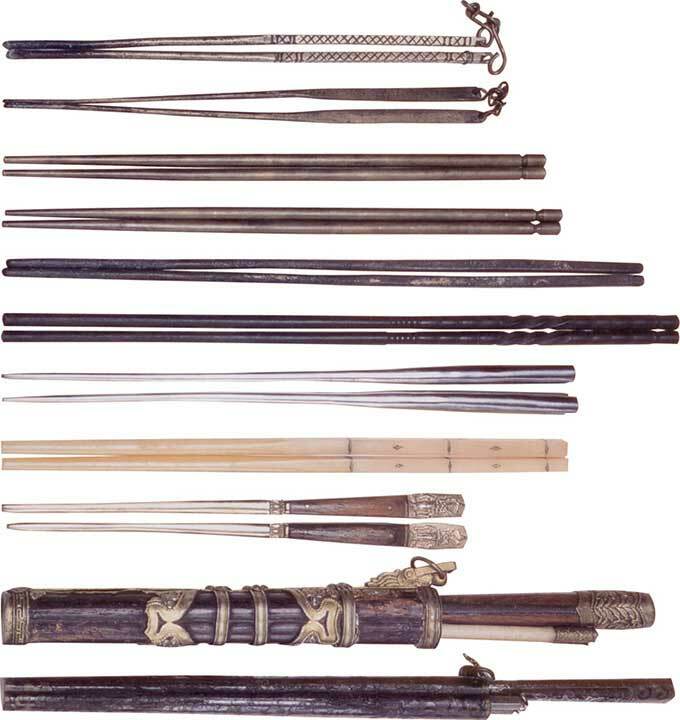 Ancient sets of chopsticks in China were commonly found with a knife and pouch, and chopsticks were frequently bound together at the handle end by a chain. 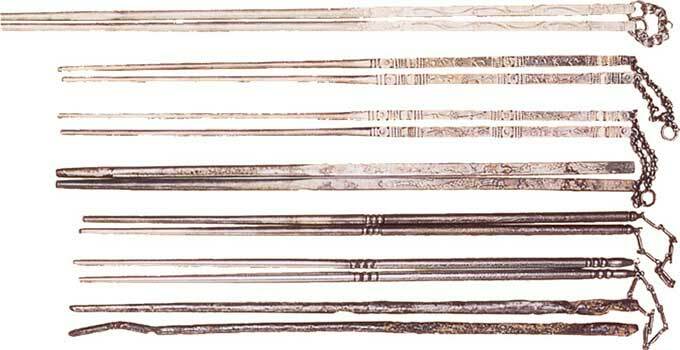 Silver chopsticks were popular with royalty as a measure of security. It was thought that silver would detect poison in food by turning black. Unfortunately for those who found out the hard way, silver has no reaction to cyanide or arsenic, but does turn color in the presence of rotten eggs, onions and garlic.